. 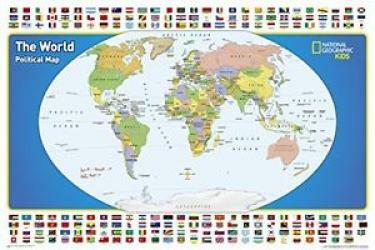 This 38" x 54" laminated World map is loaded with hundreds of elements depicting points of interest such as historical facts, local interest items, cultural features, etc. Each item is individually labeled for ease of use. 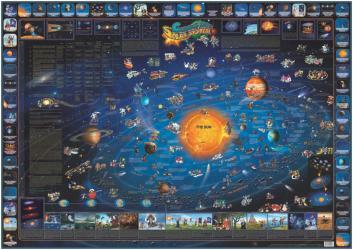 From planets, to stars, to historical satellites and other events in space, the hundreds of elements and points of information will teach about space like no other tool. This laminated map measures 38" x 54". Celebrate Americana with fascinating points of interest from around the United States. Each item is numbered to refer to the key at the top of the map for hours of educational fun. This laminated map measures 38" x 54". 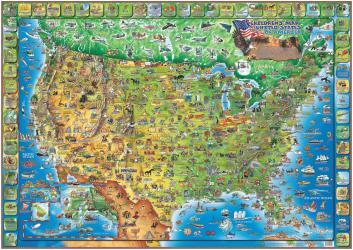 National Geographic's The World for Kids wall map is an enticing and engaging world map perfect for classroom, home or library. Recommended by geography educators for ages 7 - 12, this map features an optimized map design for readability and easy, intuitive learning. All 195 independent countries and their official, colorful flags are represented and arranged in alphabetical order for ease-of-use. 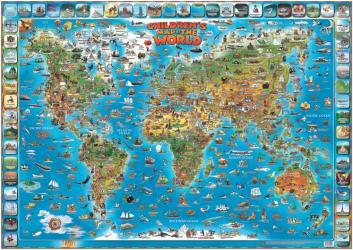 Expertly researched, The World for Kids map is an essential reference tool for today's interesting geographical world. All proceeds from the purchase of a National Geographic map help support the Society's vital exploration, conservation, scientific research, and education programs. Political map of the world for grades 4-12. National Geographic's graded-series of maps are the first to address the unique needs of K-12 students as they advance their understanding of our World. 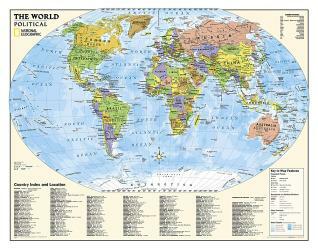 Unlike other classroom poster maps, the world maps use the Winkel-Triple projection, which provides the best combination of size, shape, and distance giving the student the best visual representation of the Earth's surface in two dimensions. This solves the effect seen on other maps where Greenland appears larger than South America. National Geographic's Political Series, grades 4-12, has up-to-date World and U.S. maps, increasing the detail of information for the teacher and student to utilize.